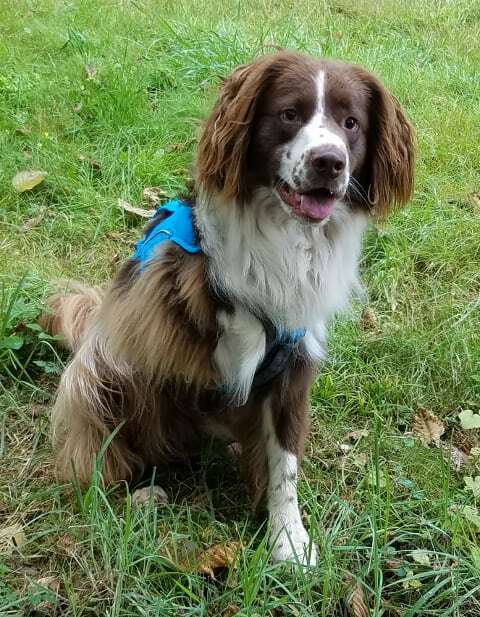 if your dog has never worn a harness before becoming a Tripawd, you’ll want to introduce the gear slowly. Dogs who aren’t used to wearing gear may try to chew the straps to get the harness off. Don’t worry if that happens. Here’s an easy Webmaster Harness strap repair tip that can be applied to many harnesses besides the Webmaster. What to do if your dog eats a harness strap. Webmaster Harness Strap Repair is Easy! Unfortunately, no harness manufacturer that we know of will warranty against chewing destruction. Here’s what to do if your dog chews harness straps to the point of breaking them in two. The above harness repair photo was sent to us by Tripawds friend Elizabeth Murphy from Austin, Texas. 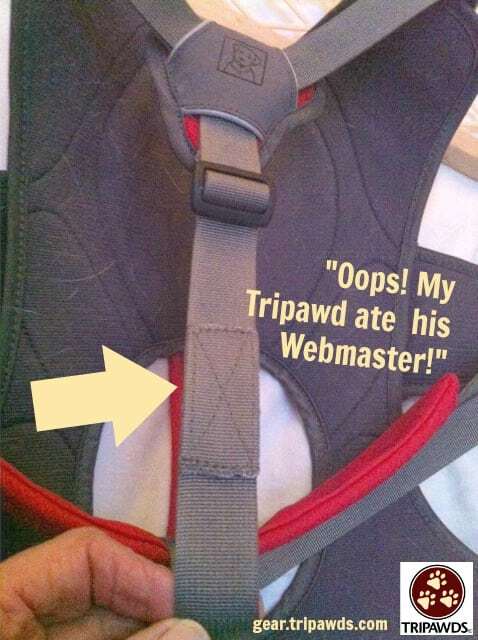 Her dog thought his Webmaster Plus dog harness was so delicious he ate the straps. But no worries. A local shoe repair shop fixed the harness strap for just $20. Lucy loves her Webmaster harness. Dogs (and cats for that matter) need time to adjust to wearing helpful gear like the Webmaster. Here’s how to make wearing a dog harness a fun and rewarding experience. These tips apply to any piece of gear. Don’t force your dog to wear a harness (or other gear) right out of the package. First, make sure all harness straps are fully extended. 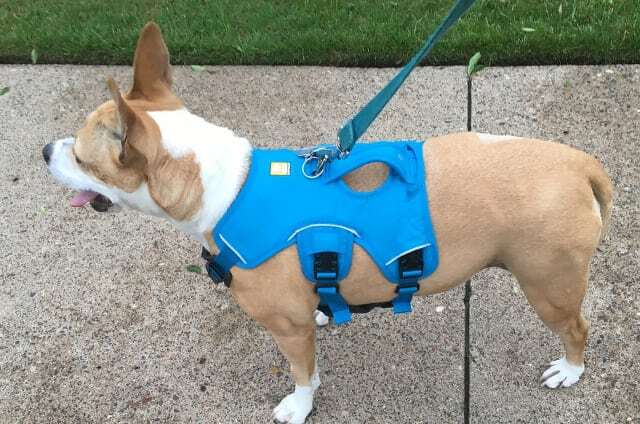 The Webmaster Harness has five points where you can adjust the fit after you place it on your dog. Day One. Get a friend for help. Ask your dog to sit. One person feeds treats while the other shows your dog the harness. Feed treats and gently put the harness neck opening over your dog’s head. Slowly take it off and feed a treat. Repeat a few more times. Put the harness on over his head again. If your dog has a front right leg, gently move the front right leg through the right leg loop. Feed another treat and slowly wrap the chest strap around your dog’s rib cage. Close buckle. Wrap the belly strap around your dog’s stomach. Close buckle. Tighten the belly and chest straps. Slide excess webbing back into the padded strap sleeve. Adjust upper front chest straps. Slide the plastic buckles away or toward the harness body. We hope this helps your dog get acclimated to the pawesome Webmaster harness. Reach out to us if you have any questions, we are here to assist. and Support the Tripawds Nation! My daughter has bit bull who just had her right front leg amputated, just had bandages removed would this work for her? If so please tell me which would be the correct one. What webpage wold I get it at. Thank you. Hi GAil. The Web Master Plus is the best recommendation for most Tripawds. It should work well on a Pit Bull. You can find all harnesses here in the Tripawds Gear Shop.